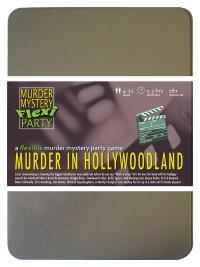 You've been invited to play the role of ELI CRONENBERG in Murder in Hollywoodland. You're invited to a star-studded yacht party, as Lucas Cameronburg is shooting the biggest blockbuster ever made! But before he can say "That's a wrap! ", he's hit over the head with his Goldguy award and pushed overboard! Join us to find out who cut Cameronburg from his own film! It’s all about making movies for you, not about how you look, which is why you play it cool with a black shirt unbuttoned at the neck and rolled up at the elbows, blue jeans and designer cowboy boots. You don’t like to be disturbed while you’re making “art” so you hide behind dark glasses. Chewing on a toothpick helps you think. I’m Eli Cronenberg, world famous horror film director and close personal friend to Lucas Cameronburg. Lucas was like a father to me, but unfortunately that doesn’t mean I’ll be inheriting his estate, which is fine by me. I wouldn’t want all those Goldguys anyway - I’m proud to say I’ve never even touched a Goldguy before let alone been awarded one. I arrived here yesterday, as Lucas wanted me to sift through the 100 or so takes of Marilyn’s goodbye wave. I was staying on as an advisor for the scene where everyone gets trapped inside the basement of an abandoned warehouse and eaten by zombies, but that was cut at the last minute. Ironically the studio have asked me to direct the film now, and that scene is so going back in!